Lee Chester Ulmer was invited on an all-expenses-paid trip to Italy, an offer he gladly accepted. But when the plane leaves today, he doesn't know if he will be on it. The 78-year-old Ellisville blues guitar musician, who hopes to join the Mississippi-based band Afrissippi for a weeklong gig, has been on an adventure of a different kind — trying to get a passport. Without the proper paperwork, not to mention the U.S. Department of State's passport logjam, Ulmer has faced an uphill battle since his application process started early last month. He has no birth certificate, no baptismal certificate, no family Bible and there's no record he received a formal education. He even says he's never been to the hospital. 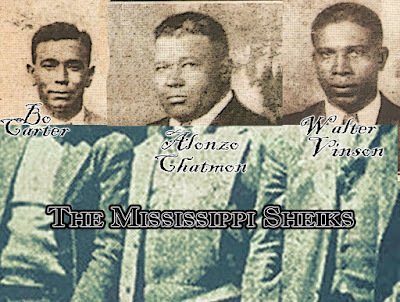 While his friends describe him as a "treasure in Mississippi," Ulmer doesn't exist to the government because he has no certified documentation. "I was born in the U.S., raised in the U.S. and am a citizen of the U.S.," Ulmer said, frustrated by his dilemma. "My daddy was a sharecropper, so you know I've got to be born here." Ulmer was born on a backcountry plantation in Stringer in 1928. He was delivered by a midwife, so there's no certified birth certificate or hospital birth certificate. He was baptized in a creek — so no baptismal certificate. He applied for a Census record online, but the request takes three to four weeks to process — time Ulmer didn't have. He attended all-black country schools that did not keep records. Ulmer doesn't have a family Bible because it was lost in a tornado in 1939. Both his parents are deceased. His 12 older siblings also are deceased, so there is no one to submit an affidavit of birth. He has never been on an air-plane. 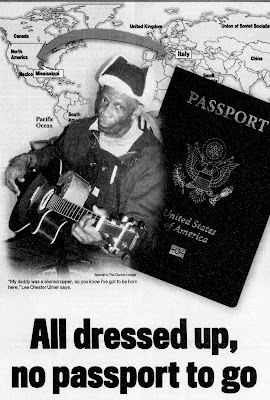 The musician took a personal trip to England on an ocean liner about 50 years ago, but passports weren't required back then. Aware of Ulmer's situation, friend and Oxford musician Justin Showah of the band Afrissippi helped file an expedited passport application May 8 at the main post office in Laurel. The four-member country blues band invited Ulmer in April to accompany them to Italy and play in a number of cities there, including Vienna, Parma and Siena. 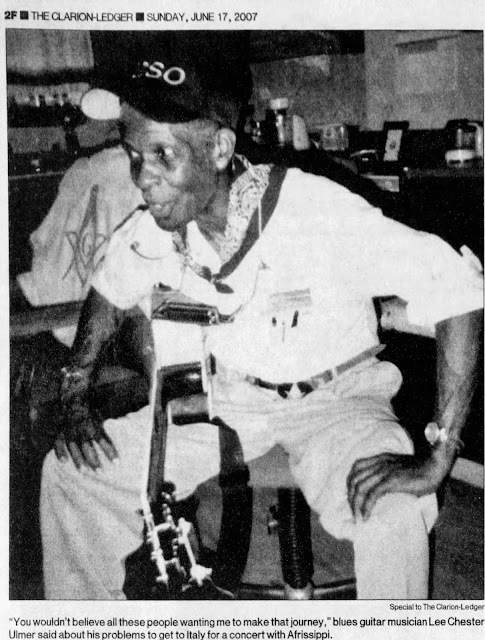 Ulmer supplied the post office with everything he had to prove his existence — driver's license, voter registration card, Social Security card, musician's union card and other documents. "It weighed about 10 pounds," he said. Post office employee Judy Smith said his application was in order and sent it to New Hampshire for processing. But Ulmer got a rejection letter nine days later. The citizenship evidence Ulmer had provided was "unacceptable," the letter said. The letter addressed by the U.S. Department of State said Ulmer needed to submit a statement from the state registrar of records certifying there is no birth record on file, which must be accompanied by a public record created around the date of birth. Also, the photos taken at the post office were too dark. Baffled at the sight of another road block, Ulmer hastily refiled his application equipped with an expedited 1930 Census record. Meanwhile, Showah wondered how Smith could not have known about the birth record state-ment and other papers Ulmer needed. "I mean, she does this all the time," Showah said. "The pictures she took were too dark, so that would have held it up anyway." Doug Kyle, communications programs specialist for the Laurel post office, said his office's only job regarding passports is to go by the application guidelines furnished by the Department of State. "There is a checklist of things we tell customers," Kyle said. "She was acting on the things we were given." 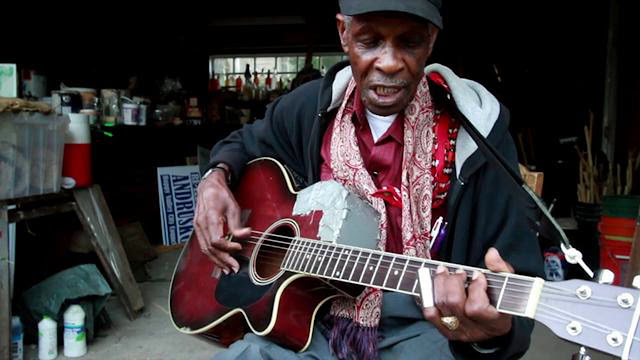 Former Jackson City Council member Marcia Weaver, business manager of Jackson musician Dorothy Moore, heard about Ulmer's situation through a mass e-mail to music enthusiasts sent by the blues-man's friends. Weaver didn't know Ulmer personally, but was moved by his story. She contacted 4th District U.S. Rep. Gene Tay-lor's office for assistance. Tay-lor aide Bill Felder secured an appointment for Ulmer with the New Orleans Passport Agency for Thursday morning to see if anyone there could straighten out the mess. "It's pretty short notice to get something done," Felder said. "All we can do is call and get an appointment." But Ulmer never made it to New Orleans Thursday. Too weary from the long week of running around and "getting the runaround," Ulmer banked on getting his passport by Friday from the New Hampshire office. Felder said Ulmer's situation was further compounded by the enormous backlog the Department of State is facing with the influx of passport applications. Passports are taking 10 to 12 weeks to process and arrive in the applicant's hand, said Department of State spokes-woman Janelle Hironimus. She also said a half million applications have slipped past the 12-week deadline. "We're getting about 1.5 mil-lion passport applications per month, and we've had 17 million for the fiscal year," Hironimus said. She added that the Department of State hopes to be caught up by September. Hironimus said she could not comment on Ulmer's case, but Felder said Ulmer's situation is not uncommon. "There are lots of folks out there with births that were never recorded, especially people Ulmer's age," he said. "We work these kinds of cases quite often." When the plane leaves for Italy today, Ulmer hopes to be riding high with the rest of the band. When asked if he was scared about possibly taking a plane ride for the first time, Ulmer replied, "nothin' don't scare me." 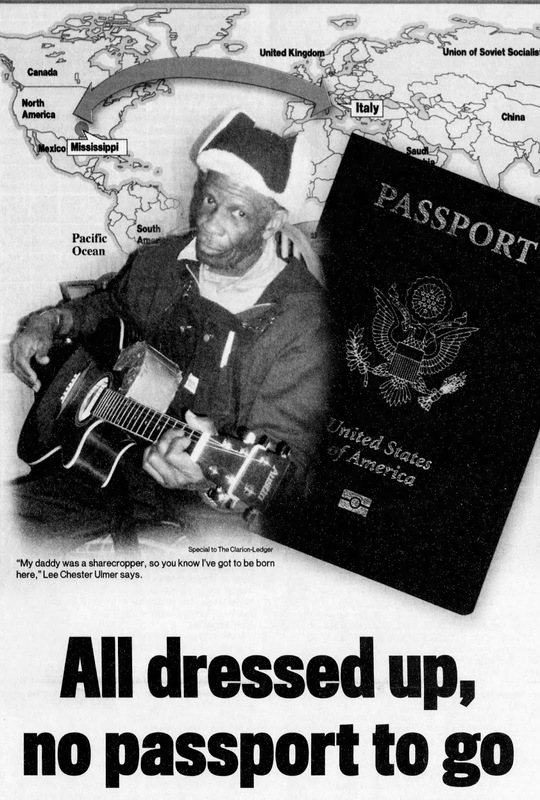 The bluesman said it will be a "miracle from God" to secure a passport in time. If it happens, he says, it will be because of the help of many people. "You wouldn't believe all these people wanting me to make that journey. "It's an amazing feeling, like love just flowing (from) every-where. That's what it feels like."